There are Hurlbutts here that have a ranch in SoHum. They might have some family history that could clear up some of your questions. If you want to be connected, send me an email and I’ll contact Will Hurlbutt or his sister Patty. Thank you, Kym. That would be interesting, esp. if they could tell who was where up around Panther Gap/ Cathey’s Peak. I know one more Hurlbutt connection, which was that Bertha Miner (aunt of recent oldtimers Buck, Allen, and Ruth Miner) married a Hurlbutt. Thanks to Susie Baker Fountain we know that there was an 1866 Daniel Merrifield assessment for a claim on the North side of the Mattole, about 6 miles above the upper crossing of same river. Mrs. Fountain also recorded a report from Springville (Fortuna), dated Dec. 5, 1876: “Mr. Merrifield, a Rainbow Ridge hunter, arrived this morning with five mule loads of venison”. Merrifield was recompensed by a Capt Knott, who had just recently opened a store in Springville. Hey Laura, is there a way that you could use the 1886 Forbes map to show where Hindley lived? There is a little mark on their most northern property due west of Cathy’s Peak ( this is how it was spelled then) that I thought might be marking a homesite. 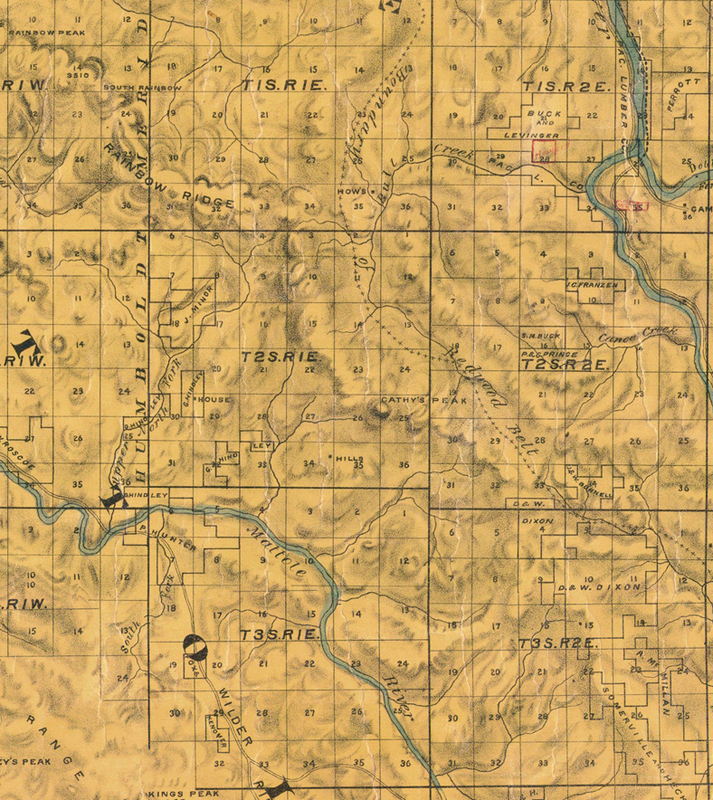 If you go to the HSU 1921 Belcher link and click on section 4 and find Cathey’s Peak in the SW corner of the map… you will see that the younger sons, Henry C. and Joseph N. have expanded the family holdings in the Windy Nip Gap area. There seems to be a dotted line trail going up from the main road up through the Hindley properties, possibly right by the mark that may, or may not be their home on the Forbes map. Thanks, olmanriver! I will have a look at both Forbes and Belcher and post map sections in a day or two… off to town today. Thanks Laura, I meant to say that the Hindley house is clearly marked on the Forbes map. I will try and be more careful before posting in the future. Interesting bit of history. My grandfather George Hackett also kept a daily journal. He was the grandson of George and Margaret Hindley. I have an old picture of the Hindley family. I do not know who is who except for my great grandfather Walter Hackett and his wife Annie and George and Margaret Hindley. I think the picture may have also uncle Henry, aunt Cora, aunt Enid, aunt Vernie, and it may have Margaret Rosco my grandfather George Hackett. I’m thinking it may have been taken around 1901or 02 but not sure. If anyone wants a copy of it contact me @ JAMichel@gmail.com and I will send a copy. Perhaps someone will be able to identify some people in the picture.